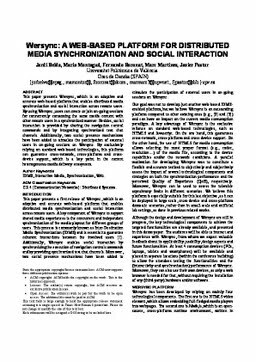 This paper presents Wersync, which is an adaptive and accurate web-based platform that enables distributed media synchronization and social interaction across remote users. By using Wersync, users can create or join on-going sessions for concurrently consuming the same media content with other remote users in a synchronized manner. Besides, social interaction is provided by sharing the navigation control commands and by integrating synchronized text chat channels. Additionally, two social presence mechanisms have been added to stimulate the participation of external users in on-going sessions on Wersync. By exclusively relying on standard web-based technologies, this platform can guarantee cross-network, cross-platform and crossdevice support, which is a key point in the current heterogeneous media delivery ecosystem. Keywords IDMS, Interactive Media, Synchronization, Web. Belda, J, Montagud Climent, M.A, Boronat, F, Martinez, M, & Pastor, J. (2015). Wersync: A WEB-BASED PLATFORM FOR DISTRIBUTED MEDIA SYNCHRONIZATION AND SOCIAL INTERACTION. In Proceedings of ACM International Conference on Interactive Experiences for Television and Online Video 2015 (ACM TVX 0).